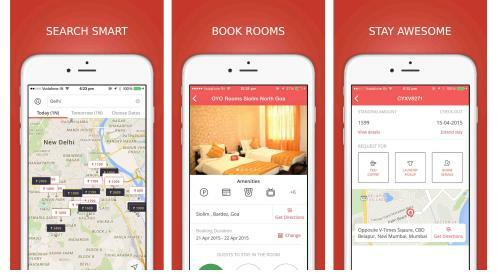 OYO Rooms, a network of technology- enabled budget hotels, announced the launch of its mobile app – ‘OYO Rooms’. The mobile app is available on Google Play Store and Apple App Store. The app takes away the need to pre-book a hotel by enabling users to book room in a fast and easy manner. It takes just 3 taps to book a room. The company claims it to be the world’s first personal room service app that allows guests staying at an OYO to order room service directly from their smartphones. Search Smart: The OYO Rooms app allows a user to search for the nearest available OYO Room from over 4,000 rooms in more than 15 cities across India. Users can search for a specific location in a city and explore available rooms on a map. The app also provides details of all available amenities as well as pictures of the room interiors to provide a completely predictable experience to users. Book Fast: Users can book the OYO Room of their choice in just 3 taps. Once the booking is made, the app allows the guest to navigate conveniently to the hotel location. It also allows users to view, manage or cancel their bookings conveniently. Users are not required to pay via the app; they can settle their bill at the hotel directly using cash or card. Stay awesome: Once a guest has checked-in, the app magically transforms into a smart butler. A guest can use the app to Request Service – such as order tea/coffee from the app. More guest-controlled services will be added to the app in due course of time. Special Offer: All OYO customers who book their first stay via the OYO Rooms app get 50% off on their first night’s stay. To avail the offer apply the coupon code APP50.